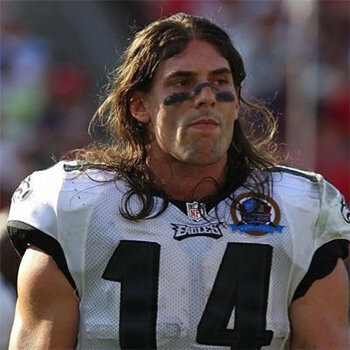 NFL wide receiver who began his career with the Philadelphia Eagles in 2010. He had his breakout campaign in 2013, catching 47 passes for 835 yards and 8 touchdowns. Cooper was born in Oklahoma City, Oklahoma, the son of Larry and Monica Cooper. He grew up in Clearwater, Florida, where he attended Clearwater Central Catholic High School and played high school football and baseball for the Central Catholic Marauders. He played college football for the University of Florida, where he was a member of two BCS National Championship teams. He was drafted by the Philadelphia Eagles in the fifth round of the 2010 NFL Draft. He was an All-State wide receiver and free safety at Clearwater Central Catholic High School in Florida. His sister, Lindsey, became a soccer player at the University of Florida. He won two National Championships and two SEC Championships while playing college football at the University of Florida. An aspiring footballer who is currently associated with the club Manchester United. His position is striker. He was a former player of Sweden national team. The very much proficient,Paula Creamer is one of the renowned name in the golf world.She is an American expert golfer. Álvaro Daniel Pereira Barragán, is an Uruguayan football player who plays for a Brazilian club São Paulo as a left back as well as national team of Uruguay. He mostly plays as left midfielder.